« EVEN THE POPE CAN’T BELIEVE WHAT HE SEES! Coca-Cola, PepsiCo, Wendy’s, Kraft Foods, Mars and many other companies are running for cover for indirectly supporting Bad Laws! With News Agencies alerting the public to the damage caused by ALEC; voter ID laws that marginalize minorities and the elderly; antiunion bills that hurt middle class and the total destruction of the Environmental Regulations that protects our society and way of life, the Council known as ALEC has become better known for their egregiously pernicious machinations. 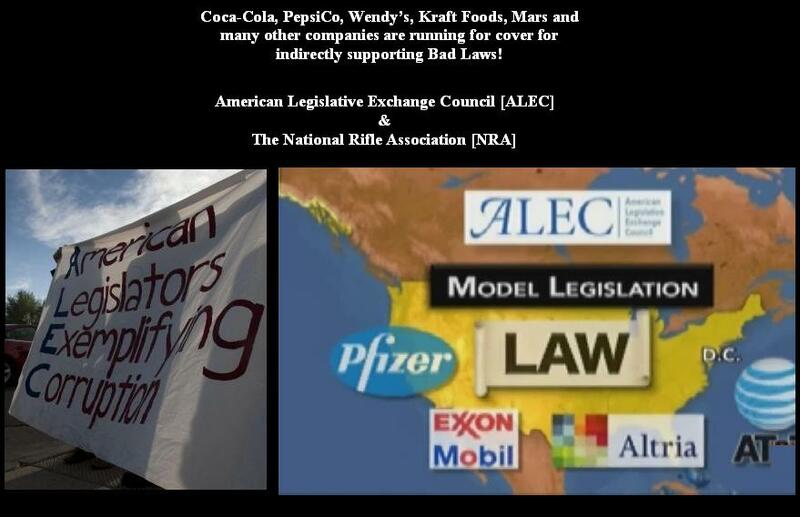 American Legislative Exchange Council [ALEC] and the National Rifle Association [NRA] have played a big role in the passage of the “STAND YOUR GROUND” self defense laws around the country. It is self evident that the Original Statute passed in Florida in 2005 and signed into law by then Governor Jeb Bush was a main factor in the local police inability to arrest George Zimmerman after he killed the teenager, TRAYVON MARTIN. The pernicious killing of the teenager that permeated pressure from activists and consumers who formed a grass-root COUNTERWEIGHT to Corporate Treasuries; caused the above Companies and others to have stopped funding [ALEC]. This pressure by Consumers is likely to continue as long as State Lawmakers are more responsive to the needs of big donors than the public interest. The former Miami Police Chief John Timoney called the “Stand your ground” law a “recipe for disaster,” and he said he and other Police Chiefs had correctly predicted it would lead to more violent road-rage incidents and drug killings. Indeed, “justifiable homicides” inFlorida have triple since 2005. Former Governor Jeb Bush signed into law in 2005 the “Stand your ground” law against the objections of Law Enforcement groups. The N.R.A. pushedFlorida’s “Stand your ground” law through the State Legislature. ALEC bemoaned the opposition it is facing and claimed it is only interested in job creation, government accountability and pro-business policies. ALEC like the NRA makes no mention of its role in pushing a law that Police Departments believe is increasing gun violence and deaths. That’s probably because big business is beginning to realize that the “Stand Your Ground” laws are indefensible. This entry was posted on April 17, 2012 at 8:38 am and is filed under Uncategorized. You can follow any responses to this entry through the RSS 2.0 feed. Both comments and pings are currently closed. It’s really a great and helpful piece of info. I’m glad that you just shared this helpful information with us. Please stay us informed like this. Thanks for sharing. Thank you for the auspicious writeup. It in reality was once a enjoyment account it. Look complex to more brought agreeable from you! By the way, how can we be in contact?